After long wait for HTC owners, most demanded and anticipated version of Android 4.2.2 Jelly Bean update for HTC One is now seeding globally. Others companies flagship have got it already Like Samsung Galaxy S4 ans Sony Xperia Z.
HTC One Sense-d is going to change a lot of android experience. They include enhanced launcher bar, quick settings, widget panel rearrangement, and Android Daydream mode. The status bar can finally show the battery percentage. New lock screen and you will be able to add widgets when lock screen. One thing that we earlier saw some developer was using; the Home key can now launch the options menu via a long press is now officially present. Swiping up will open Google Now. BlinkFeed now supports Instagram, HTC Zoe has also been enhanced alongside with the camera's AF/AE performance. 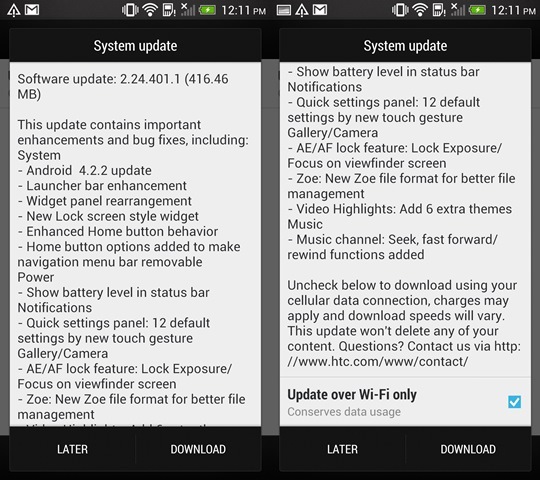 The update is currently only for the factory unlocked version of HTC One. So far news is coming out from Europe regarding the update but we’re positive this is a global rollout. The update is sized at 417MB. Carrier locked might get support from their carriers soon.